Is Dell's Android Smartphone Doomed? Dell confirmed it is releasing an Android-based smartphone, called the Mini 3, in China and Brazil, but the company's lack of details about the handset makes it hard to get excited. Dell's unwillingness to share more about the Mini 3 also has me wondering if the phone just really isn't that exciting and Dell knows it. A prototype of the Mini 3, which reportedly surfaced in August, had a 3.5-inch, 360-by-640 resolution screen, a 3.2-megapixel camera and no Wi-Fi. We at least know that the phone will run on Google's Android platform, but even that tells us nothing about version or user interface. Dell explained its secrecy by saying it will cater the Mini 3's features to the needs of each country. It seems like Dell is trying not to make a splash in the United States with whatever it introduces overseas. We've got nice selection of competitive smartphones here, so I understand why the company would want to avoid introducing something that underwhelms. At least now, Dell can reserve the right to improve the phone before bringing it stateside, if the company does so at all. Specs, aside, there are historical reasons to be skeptical of the Mini 3's success. As a gadget maker, Dell hasn't been particularly successful. Exhibit A is the DJ Ditty, an MP3 player Dell introduced in the fall of 2005. The DJ Ditty was criticized for being hard to use, and it didn't sell well. Less than a year later, Dell discontinued the gadget and pulled out of the MP3 player business altogether. 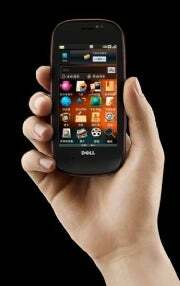 A more successful product was the Dell Axim, a line of PDAs that the company debuted in 2002. The Axim had a five-year run, and was well-liked, but the PDA market itself died in the process. Dell cited a "steadily declining market for pen-based PDAs" as its reason for discontinuing the line. The common factor is Dell's late arrival to both markets, and its failure to set any major trends in either case. Unless Dell's got something killer up its sleeve, the same will hold true for the Mini 3. In computers, it's okay to do what everyone else is doing, as long as the product is innovative, solid and the price is reasonable (think Apple's introduction of the iPod). But the smartphone market is fierce right now, and companies must constantly innovate to stay on top. Innovative the Dell Mini 3 is not. If the Mini 3 comes to the United States, I imagine it'll run with the pack just fine, but I don't think the smartphone market is done evolving yet, and Dell hasn't proven that its gadgets are fit to survive the long haul.